I worked in vaudeville for $70 a week—4 shows a day, sometimes 5 and 6—but it paid off. So sorry to hear about the new landlord situation - must be very upsetting for you all - I can understand the rent being raised, but cutting off the heat is beyond all reason, especially during the Winter months - that's very lousey. I would suggest you try to find another place in Union City, so you could retain your pupils - if you moved to N.Y. it might take some time to gather another clientele & another thing, you might have some difficulty finding a place that would allow so many animals. I think if you could make an arrangement on the heat question, it would pay you to remain where you are - I doubt if you could find any place cheaper than $80. no matter where you go - rentals are very high these days as you know, & you've got to figure the expense of moving in & out, plus loosing the income from your pupils for quite a while. If the landlord refuses to give you adequate heat, could'nt you get a couple of electric heaters or oil burners? you could move them around when necessary. Have you a lease on the apartment Rickey or on a month to month basis? if the latter, it might be better to look around the N.Y. area & see how the conditions are before you decide what to do. I note the cheap salary the agents are offering you - frankly Rickey, I think it pays to accept them occasionally, I believe in making all the appearances you can, regardless of price - you never know who will happen to see you & take interest in your talent, for a show, TV. etc. I worked in vaudeville for $70 a week (4 shows a day, sometimes 5 & 6.) but it paid off - agents & producers saw me & gave me the opportunity I needed - had I refused to play these small dates I never would have been seen or noticed by anyone - after all you have nothing to lose & everything to gain - I'm a firm believer in keep working, no matter how little you get. I played everything I was offered till I became established, & then was able to command a just & proper salary. Please to know your friends got such a kick out of the "Music Box" film - please convey my thanks for their kind message - much appreciated. I am taking some more Xray treatments - have a little cyst on my lower left eye lid, its not painful, but was starting to obstruct my vision & of course affecting my manly beauty.! The Dr. thinks about 6 or 7 treatments will get rid of it (twice a week I have to go), so not too bad. You sure have a collection of animals, birds & fish, maybe you should move into a Zoo.!! Hope your troubles will soon be over & everything running smooth again - main thing is do'nt worry too much, maybe this situation will turn out for the best - I sincerely hope so. Eda joins in love & kind thoughts to you all. Good luck & God Bless you. P.S. Do'nt bother about the Tape Rickey - just forget it till things are straightened out, theres no immediate hurry. Fortunately we escaped the Flu epidemic - it was really serious here for a time — of course I seldom go outdoors, so am not exposed to it - Eda did have a bad cold for about a week, but managed to get rid of it. I have been hearing about the severe snow storms back East, especially the Boston & New York areas, I understand the worst in many years - am sure glad I live in Sunny California. Pleased to note you've had some response to your Ads. maybe when the weather clears up you will get some definite offers. I had a letter recently from Vera Eccles - Walter's Mother passed away unexpectedly while visiting some friends in Florida - it upset him very much, especially that he was unable to attend the funeral, so I imagine thats the reason you have'nt heard from him. I was certainly sorry to hear of this as Walter is very fond of his family - she died suddenly of a heart attack, She seemed to be in very good health at the time, so naturally it was a great shock to them all. No doubt you knew that Walt's boy 'Butch' was in the Navy, he arrived in San Diego, but was in 'Sick Bay' with pneumonia, for some reason, they would'nt allow him to Land, so took him back to Japan again, where he's waiting for a return ship - strange they did'nt transfer him to the Naval hospital in San Diego when they docked there - I guess Walter is pretty worried about this too - I know he idolizes the Kid. Re the vitamins - have only been taking one a day, it said 3 a day on the bottle, but with Dr's prescription only, so I was afraid to take any chances in taking the full dose. Anyway, so far they seem to be OK & I think they help me a bit. I have'nt seen my family Dr. for a long time - frankly, I can't afford those frequent visits at $15. a crack, plus the prescriptions for medication - my budget is limited so just can't make it - living expenses are very high out here. Am taking some more Xrays right now, I have a little cyst on my lower left eye lid, which was starting bother my vision, the Xray specialist figures 6 or 7 treatments will get rid of it - am going twice a week - this is the Dr that cured my jaw ailment, so I have a lot of faith in him. Yes, I thought the last few shows of Steve Allen's were very good but I have a feeling that they soon will be discarded - he seems to have other interests - theatre films etc. Thanks for the 'Film Classic's' bulletin - very interesting - I remember those Chaplin titles very well indeed - too bad he got so fouled up. Note you got a new radio set - those Telefunken products are wonderful - I know you'll get a lot of pleasure out of it. Yes, I like my recorder very much - I'm sure you would enjoy having one too - its a lot of fun recording candid conversations with a hidden 'mike' especially at meal times with the family, & when friends visit you, you'd be surprised at how funny it sounds. I sure got a kick out of 'Cindy's' remark at the Zoo - very funny. Think thats about all for now Earl. Mrs L. (Eda) joins in kindest & best to you all. I just recd. 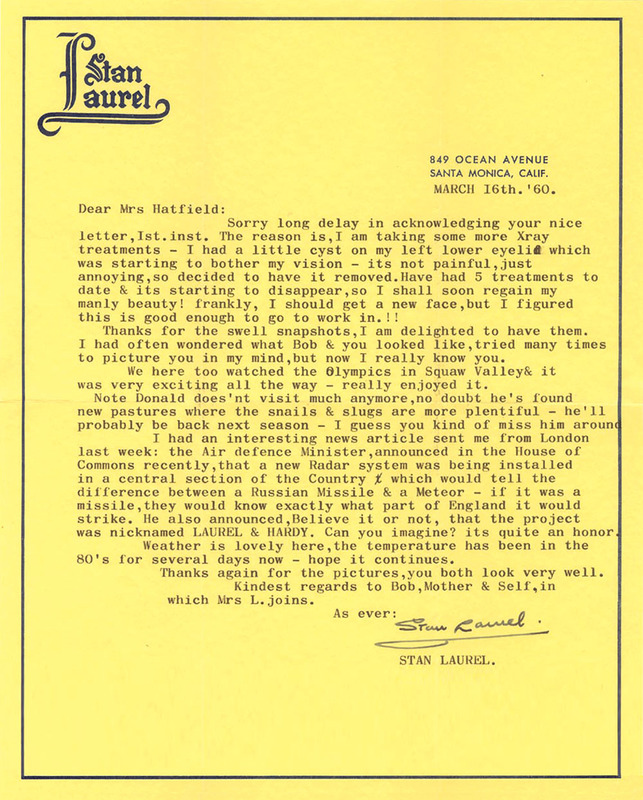 your letter, forwarded on to me from the Hal Roach Studio. Whatever information you wish to know in regard to Laurel & Hardy, please let me know & I shall be glad to answer your questions. Mr Roach, retired, & the studio is under new management, so they are unable to help you in this matter. Sorry long delay in acknowledging your nice letter,1st.inst. The reason is, I am taking some more Xray treatments - I had a little cyst on my left lower eyelid which was starting to bother my vision - its not painful, just annoying, so decided to have it removed. Have had 5 treatments to date & its starting to disappear, so I shall soon regain my manly beauty! frankly, I should get a new face, but I figured this is good enough to go to work in.!! Thanks for the swell snapshots, I am delighted to have them. I had often wondered what Bob & you looked like, tried many times to picture you in my mind, but now I really know you. We here too watched the Olympics in Squaw Valley & it was very exciting all the way - really enjoyed it. Note Donald does'nt visit much anymore, no doubt he's found new pastures where the snails & slugs are more plentiful - he'll probably be back next season - I guess you kind of miss him around. I had an interesting news article sent me from London last week: the Air defence Minister, announced in the House of Commons recently, that a new Radar system was being installed in a central section of the Country which would tell the difference between a Russian Missile & a Meteor - if it was a missile, they would know exactly what part of England it would strike. He also announced, believe it or not, that the project was nicknamed LAUREL & HARDY. Can you imagine? its quite an honor. Weather is lovely here, the temperature has been in the 80's for several days now - hope it continues. Thanks again far the pictures, you both look very well. Kindest regards to Bob, Mother & Self, in which Mrs L. joins. Yes, I am a Laurel and Hardy fan. Have been since I can remember! And I did know Laurel, which was the joy of my life, I would sit with him for hours, and learn. Thank you for your nice letter & the cute picture of yourself - nice to hear from you again & to know alls well & happy with you. I am pleased to have the photo of you to add to my collection of Fans & Friends I've saved through the years & which I enjoy looking at occasionally, its interesting to see so many friends I've never met, many of these are from all parts of the World. I note you are now a 'Teenager' - 7 years more & you'll be a grown up young Lady, & will probably be in College preparing for a career - have you decided what profession you'd like to follow? I guess you have'nt made up your mind yet. Whatever you do I wish you lots of happiness & success. Bye Mary, take care of yourself. Interesting to know the L&H films are running frequently on TV back there. We seldom see them anymore around here - once in a while they have one on the Late Late Hour, starts at 12 midnight, I think this program is specifically for the 'Drunks & Delinquents'!!. No, we never made any other Opera type films, other than "Bohemian Girl" & "Fra Diavalo". "Swiss Miss" was kind of an operetta, but was'nt classified as such, it was considered a 'Musicale'. The theme music you refer to in our films was titled "The Dance of the Cuckoos!" (Cuckoo-Cuckoo-Cuckoo). I guess thats the number you mean. You've sure had a severe winter back there. I'm certainly glad I'm living in California - do'nt think I could survive that Cold climate in the East. Pleased to tell you, I'm feeling pretty good Elmer & going along OK. Not much exciting to tell you, so Bye for now. Thank you for the belated Xmas Greeting Card calendar with view of Tynemouth Pavilion on the sands - much appreciated. It was indeed nice of you. The picture of the Pavilion brought back many happy memories of my early days - that was one of my favourite Haunts, I used to often ride the sands on my pony, her name was 'Peggy'. Do you ever see Jack & Nora Bogg? we correspond quite frequently. I understand they are leaving soon on a trip to Italy & Switzerland for a couple of weeks - they sure love to travel do'nt they? Nothing much exciting to tell you so bye for now. Mrs L. joins in kindest regards to Mr Miller & Self - trust alls well & Happy. All for now Dean. Take care of yourself. Glad you recd. the picture OK. I note you have visited California a couple of times - what town did you live in?. Interesting to know you are in the 5th Grade & also taking the Clarinet - you must play very good to occupy the first chair - thats wonderful. Thats a nice hobby collecting Tropical fish, how many do you have Dean, I imagine you have a nice aquarium for them. The first official Laurel & Hardy film was made in 1927. We made many films before that together, but not as a team, these were known as the "ALL STAR COMEDIES". I hope by now you are through with the snow storms, you must have had a pretty bad time from what I hear. Laurel & Hardy’s first “official” film together was The Second Hundred Years (June 1927), directed by Fred Guiol and supervised by Leo McCarey, who suggested that the performers be teamed permanently. That taping method is a remarkable discovery. I guess in the future, regular film will be a thing of the past. Would have written you	earlier, but decided to wait till after the 'TV Guide Awards' show & would be able to express my comments - in other words 'Kill two birds twice with one rock' or something like that, wot Shakespeare said.! I thought the whole show was in excellent taste & very well presented with a new & novel approach, & I thoroughly enjoyed your contribution Frank, your performance & style of material was very refreshing & away from the beaten path, your timing & delivery was perfect. I predict a great future for you Frank, & wish you continued success which you so fully deserve. My heartiest congratulations. I too enjoyed the pleasure of meeting you Frank - hope next time you're out here you will visit me again. That Taping method is a remarkable discovery, I guess in the future, regular film will be a thing of the past - its really fantastic. Did you contact Professor John McCabe yet, I gave you his address (N.Y. University). I had a telegram from him last week re the L&H book - said it had been accepted by Double-Day publishing Co. The deal has'nt been finalized yet, but it looks very encouraging so far - hope it goes through. Bye Frank. Good luck & God Bless. I was beginning my career as a comedian/actor when I was chosen to appear on the TV Guide Awards Show, produced by Norman Lear and Bud Yorkin. I did a comedy bit as a “censor’s son” with Robert Young and was credited as “and introducing Frank Buxton.” Stan was very kind in his comments but I remember my performance as not being that distinguished. It was the first time that Stan knew I was in the entertainment business. His reference to the “taping method” refers to the fact that the show was pre-taped a week ahead of time, a novelty at the time. The wonderful joy that surged in movies—in some movies, anyhow—back in the era of silent pictures and the heyday of the famous screen clowns surges again for fitful stretches in When Comedy Was King, a compilation of bits and pieces from those old slapsticks. The film, opened last night at the sixty-eighth Street Playhouse. Once again, in this flavor-some collection, that Robert Youngson has made as a successor and equally rich addenda to this popular The Golden Age of Comedy, Charlie Chaplin and Buster Keaton, Harry Langdon, Ben Turpin, Charlie Chase and the inestimable Stan Laurel and Oliver Hardy, not to mention many more, tumble and reel through giddy routines of old-fashioned knockabout farce. Fellows are bonged on their noggins and felons are chased by maniac cops. Langdon, the baby-faced gudgeon of all the sharpers and meanies in the world, wobbles in deadpanned innocence right into the mischief makers' traps. Keaton is stalked by a mad bomber, Wallace Beery ties Gloria Swanson to the railroad tracks. And Laurel and Hardy vie with Jimmy Finlayson in a wild contest of vandalistic spite. It is a charmingly simple memory album that Mr. Youngson has compiled and equipped with an excellent musical sound track and a mildly nostalgic narration. His somewhat historical annotations, spoken by Dwight Weist, are helpful, if one cares to listen, but are not essential to full enjoyment. No academic preparation is required to appreciate the fun in the kind of pantomimic madness that the old silent comedians indulged. Theirs was a world of wild extensions of all the embarrassments and agonies of life, even to death and taxes, heaped on the comic victims’ heads. The comics themselves were the fall guys, only occasionally coming out on top. The villains were all the representations of authority and brutality. Even today, despite television and the preponderance of the wisecrack and gag, their dilemmas are as apt and fresh as ever. Here’s a toast to this sort of comedy! WHEN COMEDY WAS KING: written and produced by Robert Youngson and produced by Twentieth Century-Fox. At the Sixty eighth Street Playhouse on Third Avenue. Running time: eighty-one minutes. The performers Include: Charlie Chaplin, Buster Keaton, Laurel and Hardy, Ben Turpin, Fatty Arbuckle, Wallace Beery, Gloria Swanson, Mabel Normand, The Keystone Cops, Charlie Chase, Edgar Kennedy, The Sennett Girls, Stuart Erwin, Andy Clyde, Chester Conklin, Snub Pollard, Al St. John, Jimmy Finlayson, Billy Devan, Mack Swain, Madeline Harlock. Vernon Dent, Bobby Vernon, Keystone Teddy.